So Sweet Tomato Designs has a new kit out, on my birthday no less! I love the kit and had so much fun playing with it. It is called (as you probably guessed) Spooks! …and four different masks for your pictures to add just that right touch. So I setup my picture to (hopefully) look like the ghost and the bats are helping to carry Angela away. Angela Faith is our first daughter and a little girl flying in heaven for a little over four years. She could not support her head herself so she always had to be carried or supported in some way. I’m working on getting a portion of my blog setup to explain more about her life and the joy and blessing she brought to us. Mommy was not here on Halloween. (Are you completely aghast yet?) 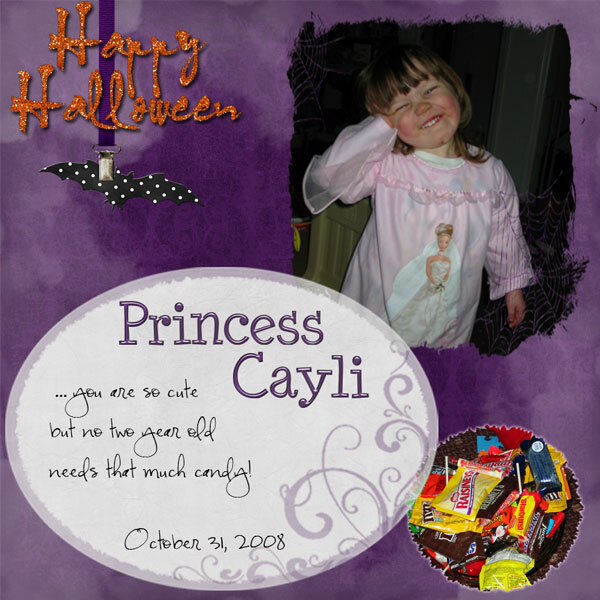 I had a meeting that I really had to be at for one of my part time jobs (wanna be web designer) so I had our youngest daughter with me and Michael (my husband) and Cayli were home for the trick or treaters. Well I guess they handed out a little bit of candy and then Cayli said how she wanted to go. We didn’t think that our then 2 1/2 year old would care about going but she was adament. So Daddy got her her princess nightgown, put some other clothes underneath and they went out. He tried to get her to head home when he was starting to get a little cool figuring that she was getting cold as well. She would not have any of it. We figured out later that she walked at least a mile around the neighborhood getting as much candy as she could. Everyone loved seeing her face and her outfit. They also loved the fact that she did not care about the chocolate (she has since changed her mind on this) but wanted all the colorful and little candy. So often she probably got more than other kids might have gotten going around that evening. So I come home and being the great Daddy that he is, he made sure to get some pictures so I would have them since I missed out on her first Halloween outing. She is so looking forward to this year and actually so am I a little. Our youngest is old enough that I think she will enjoy going around and I almost can’t wait for it this year just to have some pictures of my youngest to scrap with the kit! 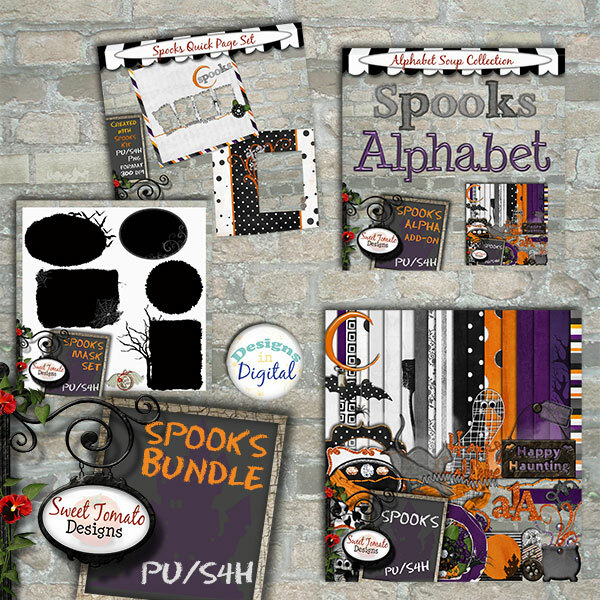 Remember you can buy Sweet Tomato Designs Spooks kit here or here so you can have it just in time to scrap your own Halloween pictures this year. Check back (see my RSS feed at the top?) 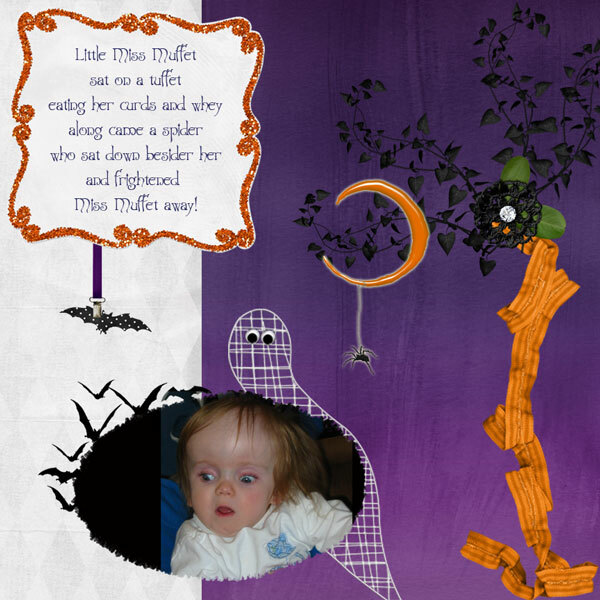 to see if I’ve pulled it off and to look at more layouts from Sweet Tomato Designs kits coming soon! Previous Post I’m a CT!